Technology has upturned the music industry and while some commentators lament the demise of the old model the music tech sector is booming. Could there be opportunities for retail investors to buy into the next big thing? In 2015 41 million people paid for a music streaming subscription and an estimated 26.8 billion individual audio streams. But artists are fighting back, they say platform streaming services such as Apple Music and Spotify do not adequately reward them for their art. Industry execs, music venues and artists are struggling to find a business model for the digital era that appropriately rewards artists them while still giving fans access to their material. The entire music industry has become a test bed for new technologies, concepts and developing platforms, some of which may end up re-writing not only the music industry but might also end up serving the wider economy. After all, it was the music industry that gave us crowdfunding when in 1997 British band Marillion couldn’t afford to tour after the release of their seventh album and fans used the then fledgling internet to raise $60,000 so they could play in the US. The platform allows music creators to set up a subscription page where fans contribute in exchange for access to exclusives, unique rewards, and experiences. The company launched internationally in March 2015 from UK offices with the mission of enabling music creators to generate revenue from their art. Today, it partners industry giants such as Universal Music, Island Records, providing them the best new talent within the music industry. It claims to have a base of more than 25,000 artists and over 280,000 users. Tradiio is now raising funds on Seedrs to continue its UK expansion and support a US launch. It has a goal to activate its model globally with automated acquisition. Beatstream is a live music streaming application which has been developed to allow Live music venues, clubs, and artists to engage with people away from the venue, by Streaming DJ sets, gigs, and concerts. The company aims to provide fans, artists, and venues with a platform for engagement and allows anyone to experience live performances. The company says it is solving the problem of engaging fans will live music in an era of steady decline with London seeing an estimated 40 per cent of small venues closing and 63 per cent of the British public claiming that they haven’t visited a live music venue in the past 12 months. This campaign is running on Crowdcube. It has valued the app at £600,000 and is looking to raise £100,000 for around 14 per cent equity. 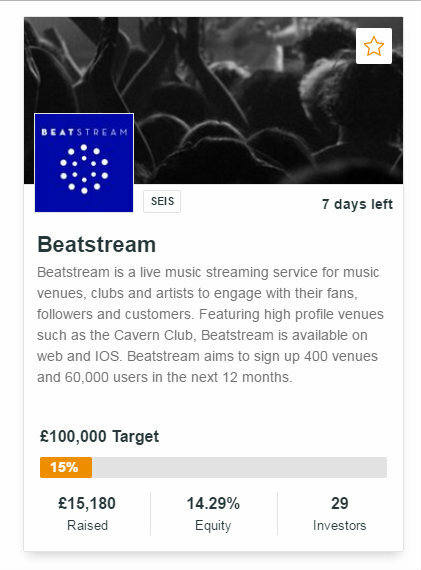 Beatstream is aiming to sign up 420 venues within the first 12 months and is targeting a total of 67,200 subscribers. It is raising capital for further platform development and a full re brand.